Background: Iodide (I-) is a vital micronutrient and its essential roles have been approved in a number of neurological activities. Therefore, there is a growing interest in developing reliable sensitive quantitative methodologies for the determination of the amount of I- in edible salt samples. Methods: First, 2heDTC was synthesized by the mixing of equivalent amounts of pure C2H7NO and CS2 in the presence of NH4OH under vigorous stirring in an ice bath. Then, AuNPs were synthesized; the 250 mL of 1 mM HAuCl4 was put into a round-bottomed flask and was boiled vigorously by stirring for 20 min. Then, 25 mL of 38.8 mM of Na3C6H5O7 was added rapidly into this solution. The solution was heated under reflux for another 15 min. The modification of the AuNPs surface was performed with 2heDTC by proceeding with the ligand exchange reaction. To the quantification of I-, 2 µL (1mM) Hg2+ was added to 0.5 mL (50 mM) of PBS solution with pH = 5.0 containing 500 µL of 2heDTC-AuNPs, which was then maintained at optimized time for the creation of bare AuNPs. Then, the different concentrations of I- were separately added. Finally, the surface plasmon resonance (SPR) absorption bands were taken with UV-Vis spectrophotometer. 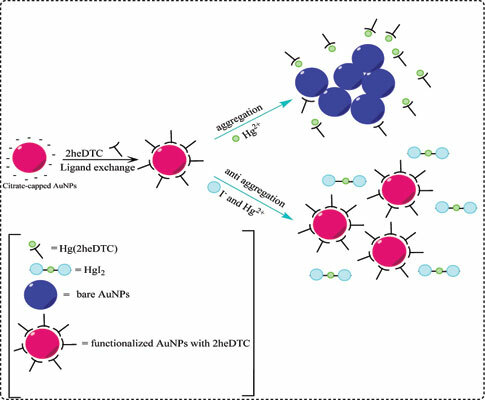 Results: The presence of Hg2+ induces the destabilization-aggregation of AuNPs due to stronger affinity Hg2+ toward 2heDTC (2heDTC(Hg)) in comparison with AuNPs, and results in the creation of bare AuNPs accompanied by a color change from bright red to blue which can be observed with naked eyes. Moreover, when I- was introduced to the mixture containing 2heDTC(Hg) and bare AuNPs, it inhibited Hg2+-induced aggregation through re-stability obtained by re-binding 2heDTC to AuNPs with abstraction of Hg2+ from 2heDTC due to more affinity of Hg2+ toward I- (HgI2) in comparison with 2heDTC. At optimum conditions, a linear calibration of the A520/A650 values versus I- concentration was obtained within 0.1-4.0 µM with LOD = 20 nM. Conclusion: Taking advantages of excellent sensitivity and selectivity, we employed our proposed nanoprobe for I- assay in the edible salt samples that facilitate the development of affordable and portable UV-Vis chemosensors for I- in food industry applications. Iodide determination, competitive interactions, aggregation, anti-aggregation, gold nanoparticles, edible salts.